Holy crap, looks like you may be on to something! I always assumed PRs had a little black, but after reading further it does appear they have quite a bit recent Canary from immigration. Makes sense. Thanks! 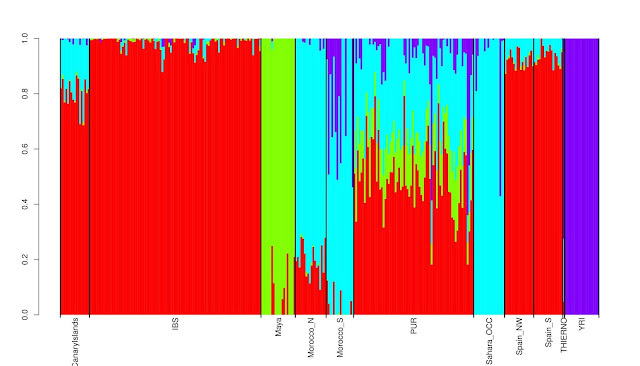 Yes indeed, the black color of the graphs from ADMIXTURE in Moreno 2013 didn't suggest a Tropical African source. It was the actual "green" component of the study, a Yoruba-like component, to be precise, which indicated this source. This is great work, I am Dominican and I have many fulani relatives some sharing as high as 16 cm. All on two segments, in my triangulations i can tell one of the segments is purely north african, noy surprisng sinces guinean fulanis ive seen have upward to 20% fulani. I have seen my fulani relatives matches on gedmatch and there arr quite a few puerto ricans. So my only critique is this blacl componennt can be a trifecta of senegambian berber via west african admix, guanche canarian admix and moorish admix in the canaries and spain. Thank you for your comment and your interest in this post. You bring many interesting issues that I would like to elaborate on and clarify. It could also be informative to other users, who are interested in them, as well. Given the widespread practice of Slavery in the Americas and the origins of the enslaved West African people who were displaced, it is normal that your data match with Fulani who tested, and more generally, West Africans. Before I start addressing your findings, I would like to briefly go over what the scientific literatures, as well as other corroborating independent analyses, which have been done by Maju and me included, have suggested on the autosomal DNA of Fulani. They have highlighted the different ancestral categories of North African and other tropical African populations by including the Yoruba, the Bulala, the Fulani, the Maasai and Luhya. It covered a wide range of North African populations from the Western Sahara to Egypt. Of course European Basques and Middle Eastern Qatari were included for "control" purposes. The software ADMIXTURE was used to perform several exercises in order to identify and separate different clusters. The method was unsupervised, meaning that the researchers didn't arbitrarily select clusters, they had employed a good sampling strategy where all the necessary proxies had been included, so they let the clusters form themselves up to k=10. You will notice in the study that North Africans have mostly the light blue component, which is the Berber component, except for the Egyptians and Libyans who the purple as their main source of ancestry. At k=8, it is clear that the peculiarity of the Fulani; in addition to their West African ancestry, is what looks like an ancestral component similar to the ones of Berber ancestry. At k=10 (see section “Supporting Information”: Figure_S1.tif) , the Fulanis form a "Fula" specific component restricted to them only, indicating, an old trans-Saharan admixture event, which after enough generations of endogamous patterns led to a distinctive genetic population in tropical Africa. Intriguingly, Maju had pretty much ran similar exercises which corroborated the findings of Henn, just weeks earlier. At k=8, he had noticed the same “Fula-specific” of the Henn’s study. I also ran the same exercise with the same populations, using ADMIXTURE, and had the same findings. I used my raw data (about 690 k of snp); I converted it to binary, bed files. I was then able to find the dataset with the same populations found in the study. I properly merged my files with the available data set using PLINK and its manual. I used the ADMIXTURE and R software (all free and available to the general public) and ran the exercise, unsupervised, several times. At k=5, I had all the clusters found in the Henn's study for k=10. My "Fula" specific component is almost 40%. I have the dark blue component which is predominantly found and restricted to North African groups for 16-18%. And finally I score for about 42-44% West African (most likely Senegambian, given other runs, I have made) ancestry, in this case similar to the Yoruba group, serving as control for "tropical Africans". None of the Fulani samples from the dataset, scored or displayed the dark blue/North African component expect me, after the formation of the “Fula-specific” component. It’s a peculiarity that applies to me and my private genetic ancestry. It should not be confused with the pattern of the genetic makeup of Fulani (composed of West African and North African ancestry), observed in all the studies and experimentations that I have just mentioned, which seem to indicate some old and complex trans-Saharan admixture events. It’s precisely the reason why I was intrigued to investigate this side of my genetic ancestry, following what I had already identified as shared North African ancestral components without any additional tropical African category, with other Latino and Hispanic Caribbean, independently from my known Fula and West African ancestry. There are Fula communities in almost every West African country, across the Sahel, and all the way to Saudi Arabia, who have been there for several generations in many cases and for some of them, as their autosomal DNA seem to suggest, reported cases of inter-mixing with local populations. Anecdotal and unexpected ancestral contributions from other populations of the region or up North in more recent times, as it is the case for me, can also be manifested and should be understood in the proper context of local historical developments. I didn’t remove my sample because it’s possible that other people who are West Africans, not just Fulani, may have similar unexpected findings with their autosomal DNA, Y-DNA, or MTDNA, which could suggest an external source of ancestry due the regional or nearby historical developments. My data mostly match with Afro-American, West Indian; and occasionally Hispanic Caribbean or Latino. When I used the chromosome browser tool from gedmatch and managed to pinpoint very precisely what segment I shared with many of them, it was a West African component with occasionally also additional traces of West Asian or North African ancestry. All indicative of shared Fula or Senegambian ancestry. I had also identified shared North African ancestral components without any additional tropical African category, with other Latino and Hispanic Caribbean. This is the side of my genetic ancestry; I investigated when I focused on my North African, non-Fula specific component which I stated in this post. My best guess for this restricted Northwest African/Berber link with Latino and Hispanics, more generally, would be oriented toward the presence of Moroccan (of North African origin) in the West African region. So hypothetically, by way of the remnants of the documented presence of the Moroccan empire in the region, or some Tuareg blood from the Sahara. I would be extremely cautious of the reported values or date estimates that are produced by commercial DNA tests. They don't seem to be reliable. You may have heard of IBS (identical by State) vs IBD (identical by descent). 16 cm, even according to those companies, is a low value to consider being relevant for genealogical timeframes, and would indicate either a very distant relative or a false positive. Date estimates, at this point, aren’t very reliable. Maju has repeatedly questioned, on this blog the method of determining the molecular clock which seems to be inappropriate and from I remember, not adequately determined in phase with what other more robust findings in other scientific fields seem to suggest: a much older time estimate for the OoA (Out of Africa) theory. I don’t know the methodology that is used by commercial DNA companies, but I would assume that they are using the wrong estimates which in any case are likely too recent in time to be accurate. It is also important to keep in mind that your MRCA (most recent common ancestor) that you share with any present-day match who may belong to a particular ethnic group, may have possibly belonged to a different ethnic group or population. Fulani have traditionally strongly practiced polygamy and frequently inter-married with people who belonged to other ethnic groups. DNA tests are also more popular among people of Fula descent and more generally ethnic groups who are located at the periphery of some geographic areas in Africa, who may have heard various “enigmatic” hypotheses about their origins, which results in more interest and curiosity than other West Africans. In the cases you would have Fula matches, and have access to the tool called chromosome browser which allows you to identify the segments, you may share with them, you cannot separate the shared segments which appear to be solely so-called North African from the tropical African ones. It doesn’t matter if they are different segments (tropical Africans and Northwest Africans), as long as they come from the same 1 individual. It would evidently suggest some possible Fula ancestry which I said seems to be quite old and most likely involved some trans-Saharan admixture. Different from regular present-day North African ancestry. 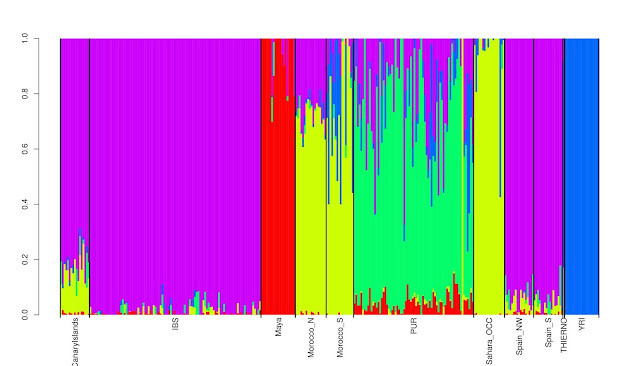 Interestingly, haplogroup E-M2_Z15939 is present at high frequencies among different Fulbe groups. The authors wrote:" Interestingly, the geographic distribution of this clade (Fig. 3b) perfectly traces the Fulbe migration from western Africa, where this haplogroup is also common in other ethnic groups, to central Sahel, where the same haplogroup is only found among Fulbe populations." It may be one of the founding lineages for Fulbe and/or indicative of recent Senegambian paternal origin. Given previous ADMIXTURE exercises of the same study from Moreno 2013 and what we know now, it is highly unlikely. If you look at the ADMIXTURE runs that precede the formation of the so-called “black” component, in the study from Moreno 2013, at k=3, you will notice that Cubans, Dominicans, Puerto Ricans, Colombians, Hondurans, and Mexicans displayed overwhelmingly by far, the “red”/European/West Eurasian component with some low to moderate tropical African/”green” component as well as some minor “blue”/Native Central American ancestry. Same pattern was observed in the experiment of this post, at k=4, the Puerto Rican samples are mostly composed of the North African/blue component and the red/Iberian component with minor tropical African and Native American. North African genetic has much greater affinity with West Eurasia than it has with Africa, expect for the presence of Y-DNA E1b, of course. Senegambian should not be described as “Berber”. I would respectfully encourage you and others, who may be interested in these issues, to become more familiar with the indigenous populations of West Africa, the local ethnic groups of West Africa, in their diversity. Berbers are indigenous to Northwest Africa or what some people in other languages can sometimes refer to as the “Maghreb”. They are not West Africans. In the last posted update, I have indicated that I had actually replaced the Yoruba samples with the Mandinka ones (from Senegal) and didn’t notice any difference in the output. Regardless of it, the use of Yoruba shouldn’t be interpreted literally. It acts as a proxy for tropical West African ancestry here. By “Moorish” I am not sure what specifically is being referenced here. If I am not mistaken, the so-called Moors of Iberia were Muslims, of North African ancestry from Northwest Africa. Maju is more familiar than me on this issue, and has blogged extensively on Iberian genetic on this blog. I don’t know to what degree the presence of the Moors may have influenced the genetic pool of Iberia. There is also an interesting blog called: “Tracing African Roots” which focuses on West African ancestry and helps interpreting every aspect of commercial DNA test, reasonably. It explains and deals with their shortcomings, while still managing to get valuable information for Afro-descendants. I would highly recommend it, even though, it deals with Ancestry DNA, but I think that Felipe’s recommendations and observations are still applicable to other companies. He has reported extensively on Upper Guinean ethnic scores for Cape Verdeans, Dominicans and Puerto Ricans in his blog. He made various hypotheses which attempt to explore possible ancestral paths for some groups with documented with links. All I can add is that "Moor" or "Moorish" derives from the ethnic Berber (Amazigh) name of Mauri, who lived in North Morocco and West Algeria in the Phoenician/Roman era and had a kingdom (later Roman province) called Mauretania. In the Medieval context of Spain that name became generic for Muslims (also those of Iberian or Slavic origin) and is still used to this day colloquially to refer to NW Africans particularly Moroccans (with some caution because it can be perceived as racist or xenophobic depending on tone and context). It's an endonym in any case (a self-given name of deep historical basis) and I know it was also used in West Africa as arabized NW Africans expanded over there in various waves (and thus the name Mauritania) and in some ethnic maps of Mali you can see the label "Moor" scattered here and there referring to groups that arrived or were assimilated with the Moroccan conquest of Shonghai in the 16th century. So I would say that Moor or Moorish is correct when applied to NW Africans, notably if we want to blur the line betweeen those who consider themselves Amazigh (Berber) and those who consider themselves Arab. It's also loosely correct when applied to the Muslim state of Al Andalus and particularly when it was incorporated to the NW African realms of Almoravids and Almohads in the late phase of the so-called Reconquista. However most of the time the Cordoba Realm or Al Andalus (first dependent Emirate, later independent Emirate and finally Caliphate as the ruling Ummayads, extremely Basque-ized by maternal ancestry, shought to restablish their claim to the overall Sunni Caliphate, with no practical effects) was independent from NW Africa and had for sure native Iberian islamized elites at least in part. We see that in the dynasties that emerged in the Taifa period, when the Caliphate broke apart into its provinces: most dynasties were Andalusi (i.e. Iberian Muslim), although a few were Berber (Málaga and Almería notably) and others were "Saqaliba" (i.e. "Slavic", Mamluk-like, these in the East: Valencia, Denia). Thierno, I was the one who questioned above. Great detailed explanation! I am seeing this fulani-specific component in the NEW 23andme being clustered under s enegambian. FOr example. my grandpa with all the Fulani matches , overlaps with 5 Mexicans, and these are large segments i'm talking aobut 15-21 cm. But basically, the "north-african" segmetn as it shows on my grandpa on CHR 12, from position 11 to 21. Shows as "senegambian and guinean" for his mexican match. So it seems in my case the north-african I share with fulanis is fulani specific. I would also add, that you say your north-african component did not get swalloed by the fulani-specific component, may there be multiple fulani-specific north-african components? and perhaps your clan has a different one from the folks tested? THe fulanis in most datasets are from Burkina Faso to my understanding. Also i'd love to chat on gchat, or any messenger about how you ran ADMIXTURE and PLINK to do this, I did this many years ago, and need a refresher. I did a blog post some time ago on my fulani matches. Your description of “fulani-specific” component in the context of the so-called “Senegambian” category from 23andme, is very incorrect. The category called “Senegambian & Guinean”, according to their own description, groups people from Senegal, Gambia, Guinea-Bissau and Guinea. Needless to say, that it has many different ethnic groups that are found all across the region. In addition, the method used by commercial DNA companies produces imprecise results. The Fulani-specific component which was identified in the Henn’s study at k=10, by Maju, as well as in my work, is produced by using the unsupervised mode of ADMIXTURE, where individual members of specific “ethnic categories” are distinctively identified. It’s completely different from the approach that consists of selecting people on the basis of recently established borders/countries or regions which aren’t reflecting the genetic or even the linguistic diversity. This is why, I suggested to you and others to become more familiar with the history of the region. Commercial DNA test can differentiate between continentally and regionally (in some cases) separated populations. With endogamous or ancient populations, the true ancestral components won’t be detected and identified. Please check the links that I shared with you. They are full of information. The Fula samples from the Henn’s study, from Maju’s exercises, and from my work are from Nigeria. Check the map of the study. I am not aware of any study on the autosomal DNA of Fulani, from Burkina Faso. I wouldn’t want to throw the baby out with the bathwater. I understand that for many Afro-descendants, as well as other communities, commercial DNA tests allow them to get information about the origin of their enslaved ancestors and/or immigrant ancestors. However, I think that excessive wishful thinking without credible evidence, may sometimes get in the way of improving our knowledge. In the conversations, I had initially with Maju, on the genetic origin of Fulani people, I shared with him narratives that are commonly found among different Fulani communities, that I've always heard without ever having the opportunity to verify them. When he showed me scientific evidence (genetic studies, his exercises), which oriented and pointed to older and different sources of likely origins, and in the process kept mentioning ADMIXTURE, I was interested to learn on my own, how to use it, and verify my private autosomal DNA more accurately. It led me to compare my data with other Fulani samples. My understanding of the complex genetic origin of Fulani people has improved, as a result. In the field of genetic, the benefit of science, is also to have reliable standards for acknowledging some hypotheses or claims. Of course, new studies or new findings can always help modify, refine current knowledge or orient in different directions. After ADMIXTURE, I experimented with many types of software that are used in the recent studies on autosomal DNA by current geneticists. Naturally, each of them has its pros and cons, and ultimately its own limitations, depending on a myriad of factors and what’s expected from the user. For present-day modern populations, with those peculiarities, ADMIXTURE works fine, if “the sampling strategy” makes sense. For ancient populations, qpAdm, f4/D stats might be better adapted than ADMIXTURE, just to give an example. Checking for standard errors and adjusting to it, is also the key. On gedmatch, what I referred to is in the Admixture utilities section, where it says “Paint differences between 2 kits, 1 chromosome”. Using Dodecad, for example, which has the North African category that’s created not just based on Mozabite samples, but also on Moroccan ones. The chromosome painting tool, is precisely what I used. I didn’t identify this restricted and shared common North African component, by just relying on chromosome positions. It doesn’t inform on the type of admixture that’s shared with other matches. Based on the information that you provided, you have no evidence to claim a fulani-specific component. If you don’t properly compare your data using the unsupervised mode of ADMIXTURE with the right populations, there is no way to know. It’s what the results from the experiments with my data suggest. That’s the idea behind those investigations. To make hypotheses, based on the outputs. It’s not impossible and it can’t be dismissed, considering that all existing Fulani communities haven’t been sampled, tested and compared to each other. However, based on the accumulated and most recent serious evidence on the subject, there is systematically a common old trans-Saharan component. If there are differences, I would say that it is mostly due to inter-mixing with local populations of the geographic area where they live. There are several studies other than the ones that I have already mentioned to you with links. This study, “Begona Dobon et al., The genetics of East African populations: a Nilo-Saharan component in the African genetic landscape. Nature – Scientific Reports 2015"
Maju made a post on it some years ago. Secondly, the paper Gurdasani et al.2014 showed in figure 7 b. an exercise which included Fula from Gambia, dating an eurasian admixture around 100 generations ago and a second one btw 320-780 ago. Lastly, the paper Busby et al., 2015, Figure 6-figure supplement 1 shows that the penetration of IBS and TSI gene flow in Africa before 0CE was via Northeast Africa. The authors stated that that they had identified some southern European ancestry in the Fulani which suggested that it might have entered West Africa via North East Africa. On this blog, Maju made a quick post on it. This is likely the same source of admixture. So already, there are Fulani samples from Nigeria, Sudan, Gambia and my anecdotal data for what it’s worth, since my grand parents were from the Fouta Djallon region of present-day Guinea. The Y-DNA study from the paper of D’Atanasio 2018, suggests a strong correlation between haplogroup E-M2_Z15939 and Fulani communities from various areas in the Sahel. My closest matches on the database of commercial DNA, are overwhelmingly Fulani people from various countries. Senegal, Nigeria, Sierra Leone, Mauritania and Mali. All the way to Saudi Arabia. I had the opportunity to write emails with some of them. Typically they date the presence of their families (in most cases the Adamawa clan) in areas such as Northern Nigeria, or the Red Sea area, no earlier than 2 centuries ago. And it would correspond to the historical events which occurred in West Africa, 2 centuries earlier. Considering the timescale in the field of genetic, that’s almost no time. It’s very recent. I just don’t see how in 2 centuries, various Fulani communities which abandoned a long time ago their nomadic lifestyle and inter-mixed with other local ethnic groups could have formed other so-called specific components. The only successful exercise with a 2-ref weighted LD significant curve was obtained with the Yoruba and the Moroccan samples. It failed for the other samples. It estimated 18.76 +/- 9.07 generations for the signal. Even using Maju’s correction of time estimate, by 1.5 or 2, it falls deep into the period of the Berber dynasties and presence in the region. I downloaded my data ( around 690k of snp) from the DNA company. I converted it to the PLINK format. Various website have scripts and tools which you can download and use. I installed Ubuntu. It makes thing easier. I found the data from the published studies. Check the links in the appendix section. It has datasets from Lazaridis. You would have to become familiar with PLINK and its manual just like with the ones from ADMIXTURE and R.
The genetic and physical positions of your files and the data you want to merge have to match, depending on the type of genomic assembly. The type of SNPs from the data you want to merge, has to correspond to the ones of the dataset you are interested in. Ideally, you want to perform ADMIXTURE’s cross-validation procedure because it will help to know which K value has the highest CV errors. I won’t lie to you, it’s a hassle and time-consuming lol. Running it using public datasets is not as bad, but merging private commercial data to them can be challenging, especially if you are trying to keep a decent number of SNPs. It doesn’t seem like it at first, but it’s perhaps the most challenging part, in my opinion. You have to be aware of previous studies and what has been established already for the populations you are interested in. Thanks again for replying so thoroughly, Thierno. I must say that I'm very pleased that those "quickies" I had already forgotten about have been of some use to you. It's always a moral gratification when you know that your little contributions have some value for others. My sample is in the exercises of the post, so issues in relation with the genetic origins of Fula people eventually needed to be addressed with clarifications. In the French speaking world, I realized that many people haven’t been exposed to this information. Eventually, one day maybe, I would like to share all this information somewhere, this time in French. Except for the presence of Fula communities in other non-West African countries and in some cases, some inter-mixing with other communities, depending on private anecdotal examples, unfortunately, many fictitious stories have been perpetuated on the so-called origins of the Fulbe people. Many historical accounts of so-called origins or migrations aren’t always true. A question remains open: does this apply to all the Spanish Caribbean, Mexico and Colombia included, as suggested by the overwhelming "black" component in Moreno-Estrada 2013 or are there nuances? Only future more extensive research can clarify this. Could you check Iberomaurusian admixture in Puerto Ricans? It’s not clear what new insight could be gained by comparing Puerto Ricans (who seem to have gone through recent founder effect) with “Iberomaurusian” ancient samples. To identify what precisely? A limited analysis which would include Guanche samples, other selected Northwest African populations, and possibly ancient samples from Taforalt, as the main focus, could help us improve our understanding of the complex genetic history of the region. From a technical standpoint, whoever it might be, would have to find the samples, sort through them, and experiment with them, I guess. In any case, it would be a difficult task. There was a study: Loosdrecht et al. (2018). It included ancient DNA samples from Taforalt. They have been compared to present-day North African and Canarian samples, in connection with other ancient samples. Just FYI. "They concluded that the "black" component which was displayed on the ADMIXTURE graphs of the study most likely had a North African origin, by way of Canarian aboriginal Guanche ancestry." I'm not sure I understand. Is this suggesting that Puerto Ricans do not in fact have a black African component derived from African slaves brought to the island? That would be plainly implausible, (obviously black African ancestry in Puerto Rico exists, brought in the slave trade from west and central Africa) so I assume I am misunderstanding something. And as far as I know, Canarians have (and Guanches had) little black African/subsaharan admixture, so a Canarian origin for black ancestry in Puerto Ricans seem unlikely (again, I apologize if I am missing something, which it seems likely that I am). The color "black", in this context, is in reference to the display of ADMIXTURE analyses. Different colors are shown in order to distinguish between clusters. They should not be misunderstood for ethnic origins. I'm not sure I understand. Is this suggesting that Puerto Ricans do not in fact have a black African component derived from African slaves brought to the island? That would be plainly implausible, (obviously black African ancestry in Puerto Rico exists, brought in the slave trade from west and central Africa) so I assume I am misunderstanding something. As far as I know Canarians have (and Guanches had) little black African/subsaharan admixture, so a Canarian origin for black ancestry in Puerto Ricans seem unlikely (again, I apologize if I am missing something, which it seems likely that I am). I see. Thank you for clarifying. It seems obvious now (and I had clearly misread the post/did not read it closely enough); all a rather embarrassing and silly mistake on my part. No problem: I can perfectly understand why the misundertsanding. You actually evidenced an issue in the clarity of the text, I would not have written it exactly that way but... not my article, so I added a clarification note in different color. Note comment above deleted because I apparently have a way too loose tongue and disclosed private info about the author he doesn't want shared. Sorry in case context is lost, comments can't be edited in Blogger. The term "black component" was used throughout the post on "Caribbean autosomal ancestry" in 2013. I simply used the exact term that was written in the post and in its comment section. This article is about the genetic history of Siberia, without too long to enter important topics. 1-)the oldest Y DNA P1(ancestor of R and Q)was found in northeast Siberia. 2-)ANE comes from another ancestor called Ancient North Siberian,and ANS Sunghir and Tianyuan hybrids. 3-)the Amerindians come from an ancestor called Ancient paleosiberian,and AP is East Asian and ANE hybrid. 4-)Baikal Neolithic(Kitoi culture Y DNA N and Q)completely East Asian,baikal bronze age was 50% AP. There are other interesting informations,good readings. P1 is not necessarily ancestral for R and Q, it can mean a parallel branch now rare or extinct. Archaeologically speaking, it should have migrated from West to East with the proto-Amerind (early Upper Paleolithic) migration eastwards, which is the only H. sapiens activity detected in Siberia before the LGM. The route of P > P1 > Q/R is clearly SE Asia > South Asia > West and Central Asia. A short update by Thierno has been added. Finally, we know the genetic structure of slab grave(deerstone)culture, one of the most important archaeological cultures of Mongolia. The Slab Grave Culture was considered proto Mongol or proto Turkic or some kind of "altaic" for a long time.However, the results show that the Slab Grave Culture was rooted in Paleo Amerind(yeniseic) like early bronze age mongolia and its closest relatives was okunev-karasuk culture in the altay-sayan region. Another important conclusion is that pastoralism in late Bronze Age Mongolia unlike the spread of Neolithic farming in Europe and the expansion of Bronze Age pastoralism on the Western steppe,it was adopted on the Eastern steppe by local hunter-gatherers through a process of cultural transmission and minimal genetic exchange with outside groups. Ok. I don't understand why you "don't believe" in Altaic language family (which I understand as micro-Altaic: Turkic, Tungusic and Mongolic only), it's become quite mainstream (because the linguistic data seems to support it). No,on the contrary,Altaic language theory has largely lost its validity today, and this result has been achieved because the basic terms in the "micro-altaic" languages do not resemble each other.Only the some Turkic nationalists and the nostraticist defend this theory. Anyhow the list of advocates and opponents and people in between is very much balanced. The issue seems unresolved. This is the freshest seima-turbino paper.The Seima seima-turbino (krotov) metallurgy was a long-time controversial subject, whether it was a local production or an external production.Apparently it was a local production and developed from the previous Odinov culture. Intriguing demonstration of how unsupervised ADMIXTURE runs can contribute to our understanding of the significance of Canarian/Guanche genetic legacy among Puerto Ricans! And quite likely also for other Hispanic Caribbeans. "This finding contrasts with the typically much lower North African scores of Hispanic Caribbeans that are reported in commercial autosomal DNA tests. I suspect that the use of Mozabite samples as proxies for North African may conflate their Berber ancestral component with the Iberian ancestral side of their complex genetic makeup." Indeed, I find it striking how your choice of Moroccan & Sahrawi samples results in a much sharper delineation! Even though given both ancient & more recent genetic connections between the Iberian Peninsula and North Africa such overlap is not surprising in itself. I have performed such an exercise for various Afro-descended people, incl. Puerto Ricans as well as native Africans. Based on a survey of over a thousand AncestryDNA results. The focus being on the African breakdown incl. Ancestry's own version of a "Africa North" region. Like you rightfully point out the North African scores on commercial DNA testing platforms such as Ancestry appear to be underestimations. Given also how North Africans themselves rarely scored above 60 % "Africa North" (before the recent update of September 2018). However I still find it fascinating how this pronounced North African connection for Puerto Ricans you found actually also came to light during my survey of AncestryDNA results among the Afro-Diaspora. In my most recent summary of these findings (featuring 8 nationalities and 860 samples) the group average for 110 Puerto Ricans was 2.9% "Africa North" with a maximum individual score of 10%. And this level (again even if quite a likely an underestimation) turned out to be the highest when compared with the other nationalities, safe for Cape Verdeans (n=90) who showed the exact same group average of 2.9% "Africa North". In general the problem with commercial autosomal DNA analyses is that it is too generic: they pre-select "artificial" model reference components (what I call "zombies", because they are not even actual populations but "distilled" components that are most concentrated in this or that area but often shared among many). So it may be an OK-ish preliminary approach but one that cannot replace properly designed unsupervised runs with an optimal "sampling strategy". In this case I "tutored" Thierno on how to design the ideal sampling strategy: we need of course some Native Americans and all the rest we need are samples from West Africa, NW Africa and SW Europe (Iberia). All the rest, say Swedes or Chinese or peninsular Arabs or Indians... are in excess because we know already Puerto Ricans don't have any meaningful inflow from those areas, they are not part of the question itself and can clutter the analysis in various ways, causing noise, etc. This is particularly true of "endogamic" populations (i.e. populations that have suffered severe bottlenecks, that clearly have low internal genetic diversity). For example many DNA testing companies use Ashkenazi Jews and people go literally nuts because they get some X% (usually small and meaningless) of that affinity, when the problem is that such endogamous popuplations tend to create their own artificial clusters or components (especially if oversampled) and attract others to their group in what is clearly an artifact, a bug and not a desirable feature of the algorithm. Some of that can happen with Mozabites and it definitely happens with the 1000Genomes Tunisian sample, which is from some endogamic population of Southern Tunisia and always gives weird results. It happens with Finns in European analyses, etc. Anyhow, finding this result was relatively hard. It is clearly there and is notable but it took several trials with different sampling strategies to have a clear result. The simplified straightforward sampling strategy I proposed: some NW Africans, some "controls" (Iberians, West Africans and Native Americans), worked best in the end. "I have also been asked to replace Yoruba with Senegambian Mandinka samples to check for potential differences. This is something that I had already checked, but I didn't notice any difference in either the Berber percentage in Puerto Ricans or in their homogenization, which indicated a recent founder effect." Thanks for letting me know! I was wondering if perhaps such Senegambian samples would make for a more suitable proxy for Tropical African DNA among North Africans as well as Puerto Ricans with minor SSA. But it doesn't seem to make much difference indeed, going by the adjusted results you showed me. In my survey findings based on AncestryDNA results for Puerto Ricans I actually also tried to account for likely substructure by subdividing my sample group in persons with minor SSA (<25%) and more pronounced SSA (>35%). Aside from the pronounced North African scores I also found it very interesting to see that for Puerto Ricans with a greater degree of SSA lineage other African regions tend to be more important, such as "Nigeria" and "Cameroon/Congo". While for Puerto Ricans with <25% SSA the regional scores for "Senegal" and "Mali" were much more predominant. I have hypothesized that this could indicate a Upper Guinean founding effect. Which would actually also be in line with the findings of Moreno-Estrada et al.(2013)!
" Independent research just published HERE shows that about half of the ancestry of Puerto Ricans is Berber (North African) rather than Iberian and thus that the Guanche or Canario ancestry hypothesis posited by Charles is almost certainly correct. " I wonder how any future research into autosomal DNA matching patterns might corroborate or refine these findings. Research conditions might not be ideal yet. But let's assume a customer database exists with 1000 Canarian DNA testers (preferably with increased Guanche lineage) as well as 1000 Spanish DNA testers (preferably from Spanish regions historically known to have been most involved in the colonization of the Hispanic Carribean). When compared with a representative sample group of 1000 Puerto Rican DNA testers would one then indeed observe a nearly equal number of DNA matches between Puerto Ricans and Canarians on the one hand and between Puerto Ricans and Spaniards on the other? And would the average size of shared DNA indeed also be nearly equal for the matches between Canarians and Puerto Ricans when compared with the matches between Puerto Ricans and Spaniards? Or will additional and more complex ancestral scenarios complicate any straightforward comparison? Also I'm wondering if maybe the time framing of absorption of either Canarian or Spanish lineage among Puerto Ricans would be a major factor? Manifesting itself also in such DNA matching patterns. A parallel to be drawn perhaps with the fascinating time framing applied in Moreno-Estrada et al.(2013). You can replicate the exercise at home, all the software and samples are public domain and gratis. It just has a mild learning curve that should be no major issue for any interested person with a bit of patience. Thanks for your input. It’s good question, but it’s really hard to say. This notion of “matching” with the data of someone else, is unclear. What is the methodology behind the so-called science which helps to determine how testers match with each other? It’s an unknown field for me. For examples, I have a known relative who tested and who shares 32 centimorgans with my data. A decent number of other unknown testers (most likely Fulani), possibly from other countries, share higher values with my data. It’s confusing. Genetic studies, usually don’t sample as many people from 1 ethnic group or 1 geographic area. They would possibly use alder or malder in order to detect significant admixture signals, and ultimately deduce time estimates. And possibly qpAdm and f4/D stats for admixture models. I think that there are really 2 different approaches to population genetic. And this explains why there is so much confusion, it seems. The methods and tools that are used by private commercial DNA companies and academic scientific studies are different, because the expectations aren’t the same. Commercial DNA deals with recent and private genealogy. It has to be more “palpable” for the customer base, so it won’t get in the depth of admixture analysis. Just enough to have discernible continentally and/or regionally separated categories. Of course, blog posts like yours add values to it because you collect results and look for patterns. On the other hand, academic studies that are produced by geneticists are not designed for this sort of individualized and recent genealogical background. They explore and analyze admixture more deeply with a much older time span. Thanks for the ideas that you shared with me privately, about exploring “matching patterns” between samples. I familiarized myself with some notions from various sources. PLINK v1.07 has an old section aimed for pairwise IBD estimation and the detection of shared segments. I simply reused the samples from the analysis. So 100 Iberians, 70 Puerto Ricans, 17 Canarians, 17 Andalusians and 17 Galacians. Shared SNPs between Puerto Ricans and Iberians for the analysis are above 150K, while shared SNPs between Puerto Ricans and Canarians/Andalusians/Galacians is around 40K. I set a minimum threshold of 5 cM and allowed for all pairs to be reported. As expected, the counts of the number of pairs sharing cumulative IBD are the highest between Puerto Rican samples. In terms of frequency, it appears that single segments are prevalent between Puerto Ricans and the rest of the Iberian and Canarian samples. Probably due to the disparity between the number of Iberian and Canarian samples, only 4 Canarians match with 3 Puerto Ricans. In spite of this, intriguingly, one of those matching segments between 1 Puerto Rican and another Canarian, is 51cM. It the highest of the entire analysis. According to various sources, the larger the segment the closer the relationship, while high frequency shared segments are more likely to indicate distant sharing at the population level. I remember when I first checked this link. Unfortunately, many links of Khan's post had already expired. I couldn't even find the dataset for the populations. So I skipped it, and went straight to use the manuals from ADMIXTURE, PLINK, and R.
I would suggest to check the links of the appendix section from this post. Thanks for explaining that, Thierno. I must admit I gave you that lead and then you figured out all the rest on yourself. So sure: better follow your references. *"On your own" (I don't think "on yourself" is a valid English phrase, sry). Article got a new update or "follow up" by Thierno.